We hear lots about ‘proprioception’, especially from barefoot running and minimalist running advocates. So, what is the proprioceptive definition in the context of running, or when running barefoot? In the context of barefoot running, proprioception means the nerves in the bottoms of the feet send information regarding touch and space to the brain, which helps us become more aware of how our feet interacts with the ground, which also helps us coordinate movements. Because the feet are better at processing sensory information when barefoot, it would make sense that we would be better at learning forefoot running, and avoid heel strike, if we were to run barefoot vs learning forefoot running in shoes. One thing that you can do to improve your forefoot strike running style is to run barefoot because doing so increases the amount of proprioceptive feedback (positional information processed on the communication highway between the feet and the brain). In my opinion, based on my learning experience, running barefoot is the best way to ‘crack the code’ for adopting the perfect forefoot running form. Learning forefoot running in cushioned running shoes is counter-productive because your foot nerves get no sensory interaction with the ground –this is why many shod-runners see no form improvements. You need to get your feet out of running shoes, and try running barefoot. Plantar proprioception, also referred to as sensory input or tactile stimulation in the feet, forms the basis for motor learning in forefoot running. The kind of amplification of sensory stimulation on the feet is way more when barefoot running than running in shoes. 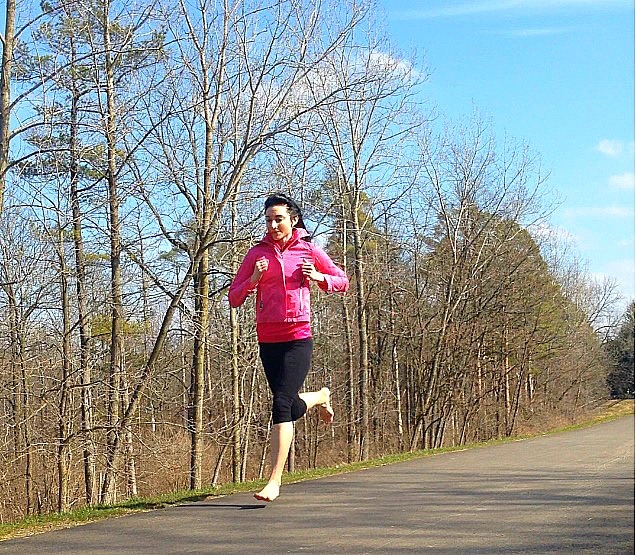 There is nothing that can deliver proprioceptive feedback better than running barefoot! One of my biggest mistakes when learning forefoot running was NOT going barefoot first. Instead, I went from running in my thick cushioned heeled running shoes to my Vibram FiveFingers, which are great for building foot and ankle strength, but a forefoot running learner needs to go barefoot to learn the proper forefoot strike landing. You are not going to be able to figure out how to land properly if you can’t feel the ground. You have to remember, there is a filter between your feet and the ground when you wear any type of footwear. To land safely and correctly on your forefoot, sensory feedback is what your body wants, and that’s why proprioception is so important. Proprioception in the feet fine-tunes biomechanical parameters, such as promoting a forefoot strike landing during running. Furthermore, using proprioception to better your biomechanics is achieved only by running barefoot or in barefoot like shoes. Muscle Control – The proprioceptors in the feet contribute to safer landings during running by regulating knee flexion at touchdown. Softer Landings – Improves detection and responses to external stimuli during running. Balance – The nerves in the feet are always communicating to the nerves in the joints of the ankle, knee and hip, for the maintenance of good balance and stability during running. Less Conscious Effort to Run – As you improve your proprioception, your reflexes will improve also and you will gradually learn to run with less conscious effort, which takes a huge load off of energy demands! Mind-Body Connection – Running barefoot or in minimalist running shoes allows plantar proprioception to improve foot strike awareness during running, thereby improving landing quality. Foot Strike Pattern and Intensity – Maximizing proprioception is key in preventing a forceful heel strike during running. Better Avoidance Behavior – Improves the body’s natural, reflexive ability to avoid high impact landings and injuries. Ankle Injury – Enables younger runners to avoid ankle injury. Falling – Prevents falls, especially in elderly runners. We rely on proprioceptive input to initiate proper biomechanical responses when running. Blocking proprioception by wearing thick, cushioned running shoes is damaging to your feet because doing so dampens your natural, reflexive responses to mechanical stimuli, thereby opening the door to tons of injury. If proprioception is blocked or reduced during forefoot running, then movement coordination suffers, but another change is taking place also: the feet become weaker. Strong proprioceptive input precedes foot strength, meaning that foot strength depends on the level of proprioceptive activation –strong proprioception activation equates to strong feet. I hope you find this information useful, and just remember that every time you run barefoot, you improve your ability to run safe and naturally. And, running barefoot is the best way to evaluate your form via proprioception as it forces you to be dependent on the feel of your form. More on why barefoot running is so great! Best running shoes for flat feet. How heel strike running causes hyper-extension knee injury.